Restoring an antique or collectible is more than a trade, it’s an art form. These timeless artifacts are irreplaceable and carry an incredible amount of monetary and (or) sentimental value. Fortunately, when an accident occurs, restoration brings peace of mind. Stephanie takes great care in full or partial restoration of the damaged piece. 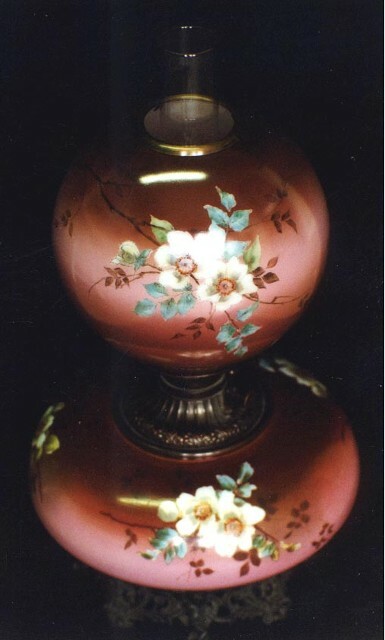 Stephanie can create a replacement glass globe to match the original base of an antique glass lamp. Pieces to be repaired (but not limited to) are china and porcelain such as Nippon, Limoges, Meissen and Sevres. Also, pottery such as Weller and Roseville, tiles, glass ware, glass globes and shades and decorative enamel ware. Glass lamp restoration is best suited to mail the original base to ensure color matching due to the extensive test firing and duplication of techniques practiced over 100 years ago. Techniques include the airbrushed backgrounds, enamel, scroll work, gold work, brush and pen work. To ship the lamp or damaged item to be repaired, it must be bubbled wrapped and surrounded by packaging peanuts in a sturdy box and place this box in another box with 4 inches of peanuts around all sides. Insurance is recommended for all shipments. All return shipments are packaged this way to ensure its safe arrival. A free estimate for repair can be provided by sending a photo of the damaged piece. Contact by e-mail or call for appointment.